The Supreme Court has failed those who needed relief the most from Aadhaar requirements. The Supreme Court on March 13 has extended the deadline for linking Aadhaar with bank accounts and mobile numbers until the final Judgement is passed. This Order came as a relief to those who had concerns regarding privacy and security of the Aadhaar project. However, what the Order did not give relief to was the Section 7 of the Aadhaar Act. This section empowers the Union Government or state government to demand Aadhaar as a proof of identity for availing subsidies, benefits or services. As per the previous Orders of the Court, there are six schemes for which Aadhaar is mandatory, including PDS, LPG subsidy and PM Jan Dhan Yojana. ‘Rethink Aadhaar’, in response to the Supreme Court Order has objected to the social security schemes being left out of the interim relief. Their press release on the Order has stated that they would press for the schemes covered under Section 7 also to be brought within the purview of the interim relief. The reasons for these objections are well founded. There is ample evidence of biometric authentication failing, and the consequences of this can be devastating. In December 2017, the Right to Food Campaign had recorded numerous starvation deaths linked to Aadhaar in Jharkhand. These deaths ranged from an 11-year-old girl, Santoshi Kumari, as well as a 64-year-old widow, Premani Kunwar. What makes the Supreme Court Order surprising in this regard is that arguments were put forth challenging Aadhaar on the ground that the biometrics system can be fooled. Shyam Divan had previously submitted before the Court that false positives and false negatives can both be obtained. He had even submitted to the Court that deduplication in the MGNREGA, PDS, and LPG subsidy schemes have taken place as effectively before Aadhaar was conceived. On March 14, Senior Counsel K. V. Viswanathan as a part of his arguments referred to the Economic Survey of India’s Report that the exclusion rates in Jharkhand and Rajasthan are as high as 49% and 37% respectively. He further stated that the State has failed to show the link between Aadhaar and plugging leakages in social security and government schemes. 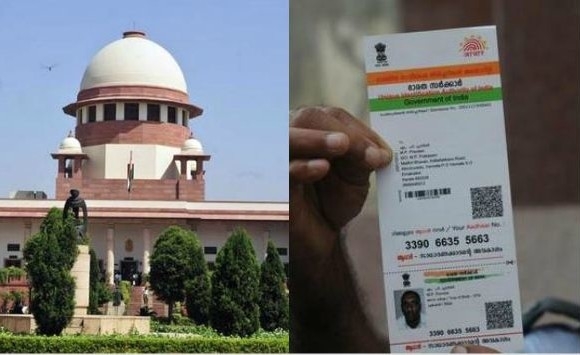 Supreme Court on the previous day had accepted the Attorney General’s submission that the schemes covered under Section 7 of the Aadhaar Act should not be affected by the interim Order. The Attorney General had informed the Court that the government was considering extending the deadline for linking Aadhaar with bank accounts and mobile services. However, one question that remains is why was the government unwilling to relent on social security schemes? One explanation for the extension of Section 7 could be that if the government relented, then the hollowness of Aadhaar would be revealed. Another, which is a bit harder hitting, is that the beneficiaries of these schemes are some of the most invisible of citizens. They are forgotten in the narrative of India’s aspirations for ‘super power’ status. Or maybe it is based on the view that the poor need to be policed, since crimes arise out of social circumstances and the poor are all potential criminals.